The story continues to follow Nitori Shuichi as he now is in the sixth grade and more people are aware of his secret. Shuichi and his friend Takatsuki Yoshino have discovered an adult with similar feelings to their own and both continue to struggle growing up and dealing with others who see them as different. On a school trip Shuichi learns who his true friends are and develops a stronger skin. Shimura continues to write a fantastic coming of age story. The characters are well fleshed out that you feel an emotional response to what is occurring in the story. The narrative has improved in this volume and it has a better flow. This is not an action packed story, but one that is endearing and worth reading for the relationships and the character growth. An added bonus to this edition is an essay on being transgendered in Japan by Matt Thorn. 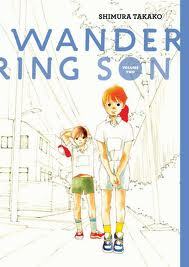 Wandering Son, Volume 2 is on ALA GLBT Round Table’s 2013 Rainbow List of recommended books for young readers. Posted by Michelle on July 6, 2013 in Book Review and tagged Gender Identity, Japan, manga, Teen Fiction, Transgender. I'm a Midwest girl who has landed herself on the east coast. I spend my days in libraryland. My passion/specialty is graphic novels, manga, and anime. For a few weekends of the year you will find me at an anime convention somewhere on the east coast. This is my favorite series. I just got volumes 3 & 4 and look forward to reading this wonderful story. This is definitely one of my favorites too! I have volume 3, but it may be a bit before I can read it as school is starting back up for me tomorrow.